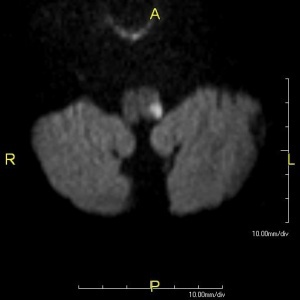 According to the National Institute of Neurological Disorders and Stroke, Wallenberg Syndrome (aka Lateral Medullary Syndrome or Posterior Inferior Cerebellar Artery Syndrome) is a neurological condition caused by a blockage of the vertebral artery (VA) or posterior inferior cerebellar artery (PICA), ultimately leading to infarction of the lateral medulla . Stroke occurring in this region of the brainstem often leads to a variety of impairments, and patients typically present with motor, sensory, cognitive, perceptual, speech and language deficits. Wallenberg Syndrome was first described in 1808 by Gaspard Vieusseux. However, a more detailed description given in 1895 by Adolf Wallenberg highlighted this condition as an infarction of the lateral medulla oblongata following occlusion of the VA/PICA. The left and right vertebral arteries (VA) run along the ventro-lateral aspect of the brainstem, supplying the medulla. 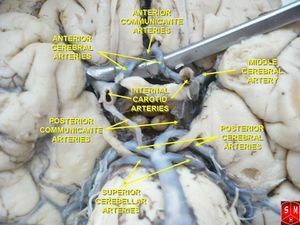 Prior to joining together at midline to form the basilar artery, both the left and right VA branch off to form, respectively, left and right posterior inferior cerebellar arteries (PICA), which themselves run dorsally and cross over to supply the lateral medulla on their way to the cerebellum. Structures that make up the lateral medulla include the inferior cerebellar peduncle, vestibular nuclei, trigeminal nucleus and tract, spinothalamic tract, descending sympathetic fibres, nucleus ambiguus and nucleus solitarius. The region of the lateral medulla is bordered by the anterior lateral sulcus ventrally, the posterior lateral sulcus dorsally, the pons rostrally and the spinal cord caudally. As the cerebellum is perfused by, inter alia, the PICA, interruption of the vascular supply in Wallenberg Syndrome can also often result in some degree of cerebellar dysfunction, though this is not classically considered part of the disease. Due to the very compressed placement of nuclei and tracts within the lateral medulla, Wallenberg Syndrome resulting from a stroke in the VA or PICA often leads to abnormalities in many systems, including the vestibulo-cerebellar, sensory, bulbar, respiratory, and autonomic systems. Clinical presentations vary dependent on which specific nucleii and fibres are involved. Clinical Picture based on Location (Nicholson, 2009). Among these, sensory symptoms & signs, gait ataxia, dizziness and Horner's sign are the most common, with sensory symptoms & signs occuring in up to 96% of all lateral medullary infarct patients; less common, but still present in at least 50% of cases, are dysphagia, hoarseness, vertigo, nystagmus, limb ataxia, nausea/vomiting, and headache. Incessant hiccups are highly correlated with the presentation of hoarseness and dysphagia, and are likely due to infarction affecting the nucleus ambiguus. The dysphagia that occurs in the acute phase of Wallenberg syndrome can be particularly severe in comparison to hemispheric stroke victims, often requiring assisted feeding (often a nasogastric tube), though in cases of unilateral infarct of the lateral medulla, recovery is generally good, and it is thought to occur via a mechanism involving the unaffected side of the medulla. A large study of 130 patients with MRI-identified infarctions limited to the lateral medulla found that lesions toward the rostral end of the medulla also tend to be more ventral, and produce dysphagia, dysarthria and facial paresis more frequently, and headache and gait ataxia less frequently, than lesions at the caudal end, which themselves tend to be more lateral. A study reviewing 25 cases of Wallenberg Syndrome found the incidence to be highest in middle-aged men at 55.06 years of age. The greatest risk factor for Wallenberg Syndrome is currently believed to be large artery atherosclerosis, which is often linked to a history of hypertension, diabetes, and smoking. The most common cause of Wallenberg Syndrome is ischemic stroke in the VA or PICA of the brainstem, often the result of a thrombus or embolism. Dissection of the VA following mechanical trauma or head injury is a second important risk factor, and is more common in younger patients. A number of other conditions, however, have also been found to be associated with Wallenberg Syndrome, including metastatic cancer, hematoma, aneurysm of the VA, arteriovenous malformation, and multiple sclerosis. The long-term outlook varies quite substantially, with some individuals seeing a decrease in symptoms within weeks of onset, whereas others may have symptoms persist for years with permanent disability. With appropriate treatment, clinical monitoring, and post-stroke care, the prognosis for recovery remains positive. The majority of patients have minimal deficits at six months, and over 85% have been found to attain functional independence with ambulation within a year. Overall, researchers have yet to confidently determine how this type of stroke occurs, and considerable research is still required to further understand the condition. Patients with a suspected lateral medullary infarction require an expeditious assessment that critically evaluates the presenting symptoms and establishes a timeline of symptom onset. A neurological examination should be performed initially for the purpose of differentiating between a true stroke and conditions that may mimic the presentation of stroke. Individuals with a lateral medullary infarction typically present with vestibular-related symptoms making it a priority to identify these symptoms as a result of damaged structures within the lateral medulla. A three-step oculomotor examination called HINTS (Head-Impulsive-Nystagmus-Test-of-Skew) has been shown to be a valid and promising tool for determining the presence of a lateral medullary infarction in patients who present with an acute vestibular syndrome. In addition to the clinical examination, the use of Computed Tomography (CT) and Magnetic Resonance Imaging (MRI) can assist in determining or confirming the exact location of the infarction. While CT is more widely available, MRI is the preferred imaging standard for detection of acute stroke, generally offering greater sensitivity and specificity. It should be noted, however, that these imaging tools can be unreliable for locating an infarction at the level of the medulla; this drawback underscores the important role an early and accurate clinical examination plays in establishing a diagnosis for Wallenberg syndrome. All patients with suspected Wallenberg Syndrome should receive immediate care and neuroimaging in order to exclude differential diagnoses and to screen for any contraindications to suggested stroke therapies. In most cases, patients are initially prescribed medication in order to combat chronic/long-lasting pain. In cases of ischemic stroke, blood-thinners such as heparin or warfarin can also be prescribed to lessen the blockage in the arteries that supply the lateral medulla. This is also an important component of preventing future blood-clots, which themselves would further occlude the vasculature supplying the lateral medulla, from forming. In extreme cases with large blockages, surgery can sometimes be performed to remove the clot (although rarely is due to the difficulty of accessing this area of the brain). Repetitive transcranial magnetic stimulation has shown promise in aiding rehabilitation of the dysphagia that often presents in Wallenberg Syndrome. Physiotherapy can play an essential role in helping those with Wallenberg Syndrome regain their functional independence and reintegrate into their communities. Considering Wallenberg Syndrome is most commonly the result of a stroke in the lateral medulla, the condition is managed using traditional stroke rehabilitation protocols, individualized to each patient. Training should be extremely meaningful, engaging, and challenging. Instead of following a redundant mechanistic approach to rehabilitation, practitioners should instead use graded real-life activities that are purposeful and meaningful to the individual client. As a result, treatment of Wallenberg Syndrome varies depending on the particular deficits shown by the client. In many cases of Wallenberg Syndrome, speech, language, and swallowing therapy may be beneficial. A specialized form of neuromuscular electrical stimulation (NMES) called VitalStim has been cleared by the US Food and Drug Administration specifically for treatment of pharyngeal dysphagia when administered by appropriate healthcare professionals, though in practice this is normally done by speech language pathologists and occupational therapists. Physical therapy is used to combat balance, coordination and movement deficits that are commonly associated with the disorder. Treatments should focus on task-oriented training, environmental adaptation, and motor retraining, in order to improve functional ability. Furthermore, it has been found that electrical stimulation has a beneficial effect on improving muscle strength and balance in patients with stroke. Current best evidence supports the use of electrical stimulation for the facilitation of motor recovery, and should be incorporated early on in the rehabilitation program. As Wallenberg Syndrome is not an overly studied condition in the world of neurological disorders, there have been no specific outcome measures created deliberately for use with this specific condition. Considering the condition is most often the result of a stroke, traditional stroke outcomes measures can be used to objectively determine baseline measures and progress with treatment/interventions. This list provides a few useful measurement tools that we believe can be utilized in the assessment and treatment of Wallenberg Syndrome. (N.B. this list is by no means exhaustive). ↑ 1.0 1.1 1.2 National Institute of Neurological Disorders and Stroke: Wallenberg Syndrome. https://www.ninds.nih.gov/disorders/all-disorders/wallenbergs-syndrome-information-page (accessed 4 May 2017). ↑ 3.0 3.1 Nicholson J, Paralkar U, Lawton G, Sigston P. Lateral medullary syndrome causing vocal cord palsy and stridor. Journal of the Intensive Care Society. 2009 Jul;10(3):218-9. ↑ 4.0 4.1 4.2 4.3 Kim JS. Pure lateral medullary infarction: clinical–radiological correlation of 130 acute, consecutive patients. Brain. 2003 Aug 1;126(8):1864-72. ↑ 5.0 5.1 5.2 5.3 5.4 5.5 5.6 Day GS, Swartz RH, Chenkin J, Shamji AI, Frost DW. Lateral medullary syndrome: a diagnostic approach illustrated through case presentation and literature review. CJEM. 2014 Mar 1;16(02):164-70. ↑ 6.0 6.1 Genetic and Rare Diseases Information Centre: Wallenberg Syndrome. https://rarediseases.info.nih.gov/diseases/9263/wallenberg-syndrome (accessed 6 May 2017). 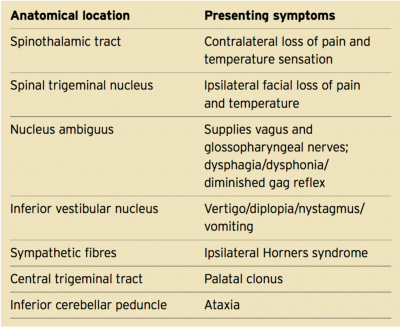 ↑ Aydogdu I, Ertekin C, Tarlaci S, Turman B, Kiylioglu N, Secil Y. Dysphagia in Lateral Medullary Infarction (Wallenberg's Syndrome): An Acute Disconnection Syndrome in Premotor Neurons Related to Swallowing Activity?. Stroke. 2001;32(9):2081-2087. ↑ Day G, Swartz R, Chenkin J, Shamji A, Frost D. Lateral medullary syndrome: a diagnostic approach illustrated through case presentation and literature review. CJEM. 2014;16(02):164-170. ↑ Kattah JC, Talkad AV, Wang DZ, Hsieh YH, Newman-Toker DE. HINTS to diagnose stroke in the acute vestibular syndrome. Stroke. 2009 Nov 1;40(11):3504-10. ↑ Chalela JA, Kidwell CS, Nentwich LM, Luby M, Butman JA, Demchuk AM, Hill MD, Patronas N, Latour L, Warach S. Magnetic resonance imaging and computed tomography in emergency assessment of patients with suspected acute stroke: a prospective comparison. The Lancet. 2007 Feb 2;369(9558):293-8. ↑ 11.0 11.1 Health Line: Wallenberg Syndrome. http://www.healthline.com/health/wallenberg-syndrome#diagnosis4 (accessed 6 May 2017). ↑ Khedr E, Abo-Elfetoh N. Therapeutic role of rTMS on recovery of dysphagia in patients with lateral medullary syndrome and brainstem infarction. Journal of Neurology, Neurosurgery & Psychiatry. 2009;81(5):495-499. ↑ 13.0 13.1 13.2 13.3 Chan IT. An evidence-based practice for the treatment of lateral medullary syndrome. Hong Kong Journal of Occupational Therapy. 2009 Dec 1;19(2):50-5. ↑ Gupta H, Banerjee A. Recovery of Dysphagia in Lateral Medullary Stroke. Case Reports in Neurological Medicine. 2014;2014:1-4.